The perfect get well gift idea. This "Get Well" is an authentic medicine cabinet filled with old fashioned remedies to set your patient on the road to good health. The cabinet, which can actually be saved and mounted contains Dr. Hathaway's Prescribed Rx labeled Old Fashioned Lemon Drops, Sour Cherries, and Chocolate Covered Sunflower Seeds. 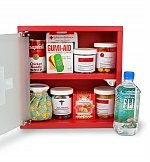 To complete this unique kit, we include a Fiji Natural Artesian Water, two cans of Campbell's Chicken Noodle Soup, a Johnson & Johnson Mini First Aid Kit, and Ahmed Strawberry Tea. 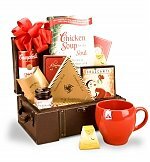 A unique get well gift to help the recipient quickly jump back on the road to recovery. Measures 18" x 16" with mounting hardware included.